My previous posts on Amundsen Sea Polynya and their development showed ~37,600 km2 of open water in front of the ice shelves. It is very early spring in Antarctica at this time of the year and it’s still cold. That means sea ice can still grow. This is the Dotson Getz polynya on 9 October 2016. It has a perimeter of ~800 km and an area of ~25,500 km2. The Dotson Getz polynya on 9 October 2016. Open water is black and streaks of sea ice growth are clear. The location of the Bear Peninsula Automatic Weather Station is marked. I put together the satellite data from 9-12 October 2016 and it shows extremely rapid sea ice growth. The Dotson Getz polynya 9-12th October 2016. The loop starts and ends with the true colour MODIS image. The blue shades in between are bands 7-2-1 and they pick out the new sea ice growth as the wispy blue streaks. From the 11th-12 October the polynya is starting to be covered in a form of sea ice called frazil ice – I wrote about frazil in a post called oil on troubled water, ice on rough seas. These ice crystals are the first stage of sea ice growth. The Dotson Getz polynya 12th October 2016 in MODIS bands 7-2-1. The frazil ice growth in the polynya is clear. 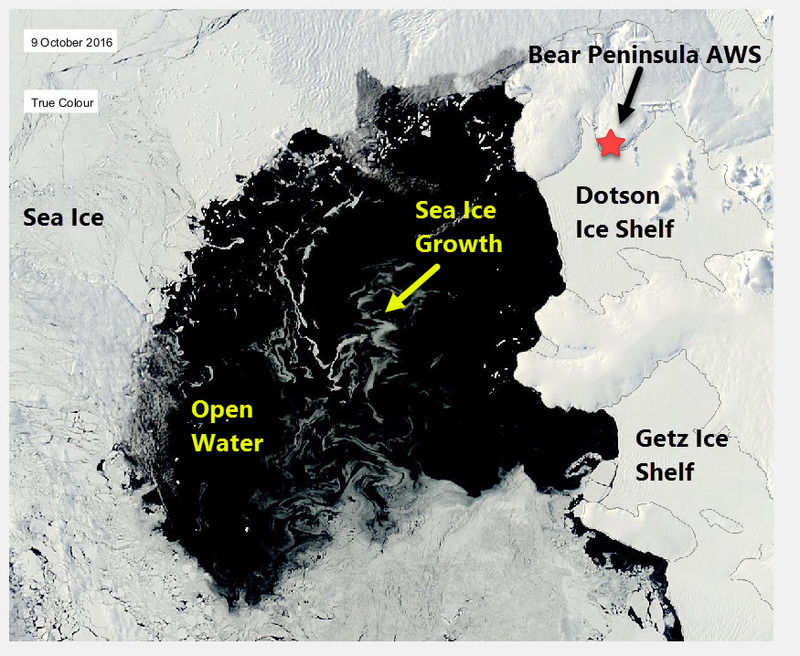 So what is causing the sea ice growth? The Bear Peninsula Automatic Weather Station can give us some real time weather data. Here is a plot of selected weather parameters for the last two days. Automatic weather station data from Bear Peninsula 11 to 13 October 2016. The air temperatures are about -17°C, and winds are around 25 ms-1. Actually at sea you would actually classify if it as a Beaufort Force 10-11. 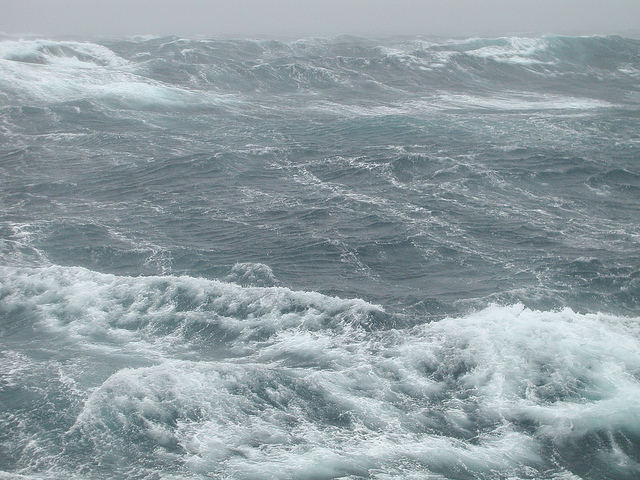 Given enough time for the seas to develop you could get waves of maybe 10 m.
Beaufort Force 10 in Antarctica. I am glad I am not at sea in front of the Dotson Ice Shelf. From an ice generation point of view temperatures of about -17°C, and winds around 25 m/s are very similar to what I encountered in the Greenland Sea in winter a very long time ago. (Brandon and Wadhams, The near surface hydrography beneath the Odden ice tongue, 1999). At the moment in the polynya I’d expect a net heat loss from the ocean to the atmosphere of around 800 Wm-2, and ice generation of about 20 cm per day. Can you see this ice growth in the passive microwave satellite data? The sea ice extent in Pine Island Bay 9-12 October 2016. Data from DMSP SSMI. 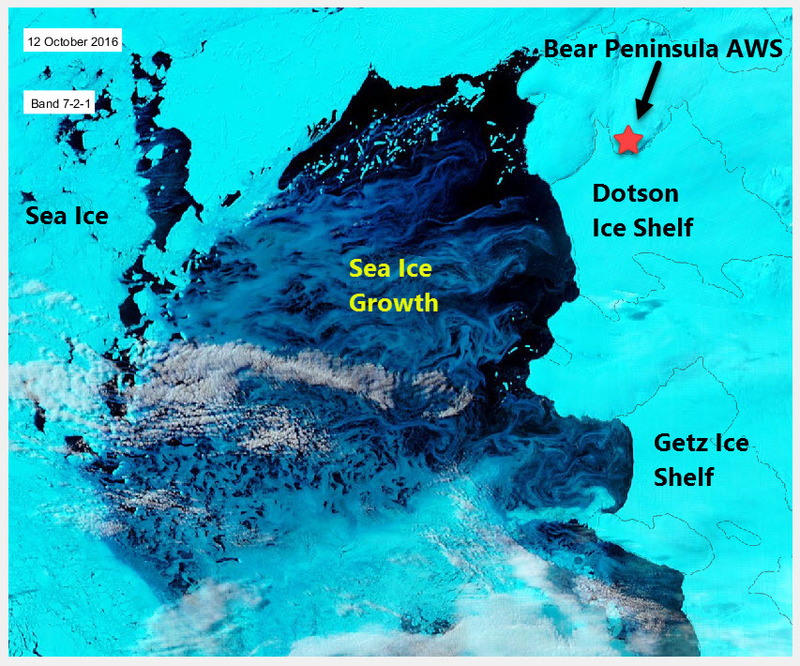 The Dotson / Getz polynya reduces in size. Over the 4 days shown above the dark blue region clearly reduces in size - but it's worth noting the satellite data I am using for that plot has a large footprint. This means the frazil ice is showing up as a lower concentration. What we really want is data from a radar satellite. Posted in Science. Tags: Amundsen Sea, Antarctic, Dotson Ice Shelf, frazil ice, MODIS, polynya, sea ice on October 13, 2016 by Mark Brandon.